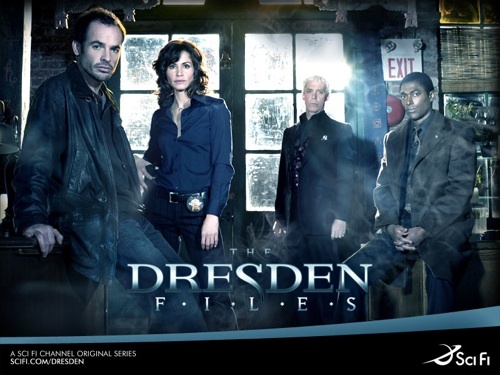 Early in 2007, The SciFi Channel aired The Dresden Files, a drama based on the novels of Jim Butcher and produced by Nicolas Cage. Later that same year, the channel completed airing the twelve episodes produced and did not pick up the show for a second season. I consider this to be a tragedy. The Dresden Files was smart, funny, suspenseful, action packed. On the whole, a great time. The premise of the story is that magic is real, and all the mythical monsters that haunted your childhood and mine, they’re real too. Harry Dresden (played by Paul Blackthorn) is a wizard who is trying to protect the innocent from the magical world all around them. As the hero wizard biz doesn’t pay that well, Harry also takes on cases with supernatural content as a private investigator. Since gigs in the PI biz are hard to come by, he also consults for Lt. Connie Murphy (Valerie Cruz), an attractive, hard-as-nails detective with the Chicago PD. She doesn’t believe in any of the mumbo jumbo that surrounds Harry’s life, and hers. This is one of the things I truly loved about the series, how it approached the issue of belief. Harry made no bones about being a wizard, painted it on the front door of his office, in fact. Still, he never tried to convince anyone to believe any of it. He astutely determined if a person was open to the idea, and if they weren’t, he made simple excuses for all the weirdness, and people bought it. This is much as it is in life, I have found: Folks believe what they want, and fit the evidence around them to that belief. Harry was “out” as a magical being, but never tried to make anyone accept him as such, and as a result was able to walk in both worlds. Harry is attended by Hrothbert of Bainbridge (Terrence Mann), an ancient ghost cursed to forever inhabit his own skull, which is currently in Harry’s possession. They have been friends since Harry was a boy, when Harry decided to start calling him “Bob”. Bob trained Harry in the mystic arts, and is an invaluable source of knowledge in Harry’s investigations. Wait, if that’s not enough for you, Harry is regulated in the magical world by the High Council, a group of wizards and magical beings that enforce the laws of the magical world, and protect it’s secrets. Between the Chicago PD, who are dubious as to his talents and motives, and the Council, who outright don’t like him, Harry has lots of issues with authority. The tone of the program is set by Raymond Chandler, and Harry is a surrogate Sam Spade. The story is told through witty narration, giving the audience the feeling that they are in on it, and the dialogue is snappy and fun. The city of Chicago is a prominent character in the series, with gorgeous establishing shots and the essence of Chicago still to be heard in the excellent acting. The good news is that you don’t have to miss it anymore, thanks to DVD and the Internet. Season one is available at your favorite online book and DVD sellers, and if you want to check it out first, it can be seen on those alien-conspiracy-to-rot-your-brain websites for the price of brief commercial interruption. I strongly recommend that you check it out, and let me know what you think. While you’re at it, if you know any obscure or under viewed SciFi that you really dig, let me know about that too. Maybe I’ll like it so much that I’ll feature it. You never know. Imagine that you are a Secret Service agent with a promising career and just a few minor blemishes on your record due to your unusual methods. Suddenly, you are reassigned to, of all places, a gigantic government warehouse in the middle of nowhere, South Dakota. Your new task: To collect and protect America's deepest, most bizarre secrets. Welcome to the world of Warehouse 13. It goes something like this: Secret Service agents Pete Latimer (Eddie McClintock) and Myka Bering (Joanne Kelly) are yanked off of their promising career tracks to serve as agent of Warehouse 13, a super secret repository for relics and artifacts of unbelievable power and historic significance. Artie Nielsen, played superbly by veteran character actor Saul Rubinek, is the somewhat eccentric manager of the facility, while the operation is run by the mysterious Mrs. Frederick (CCH Pounder, 'nuff said). Pete and Myka fly in the face of convention in many ways. Pete has empathy and is driven to act on his astounding intuition, while Myka is the analytical mastermind of the team, flying in the face of traditional gender assigned skills. Also, and I pray that this remain so, the energy between these two partners is not sexual. I have no interest in watching yet another show where the male and female leads pretend they are not hot for each other. I find their camaraderie refreshing. The short, simple analogy for this show is that it's the X-Files without all the alien nonsense, but that doesn't describe it, really. There is one word that does, though. Fun. Take X-Files, take the old Friday the Thirteenth series, and recast it as a comedy/light drama. The show is witty, clever, and completely fails to take itself seriously. It strikes a brilliant balance between a too heavy drama and a ridiculous comedy. Its strengths lie in it’s plotting, it’s wit, and the unique relationships between it’s greatly varied characters. I look forward to seeing more of the show, and Sy-Fy has picked it up for a second season, so let the fans rejoice. In the meantime, they have a very clever web site you may enjoy up at www.syfy.com/warehouse13/. Included, among other fun stuff, is a detailed history of the warehouse, dating back to 323 BCE. Founded by Alexander the Great, it seems that our warehouse is the thirteenth incarnation of the facility. Go forth, have a laugh. It’s good to laugh a little.